The northeast corner of Main and Corcoran Street has seen its share of building drama. For much of the 20th century, it was the location of one of the buildings on my Top Five list of How-Could-They-Have-Torn-That-Down buidings in Durham: the Geer building. 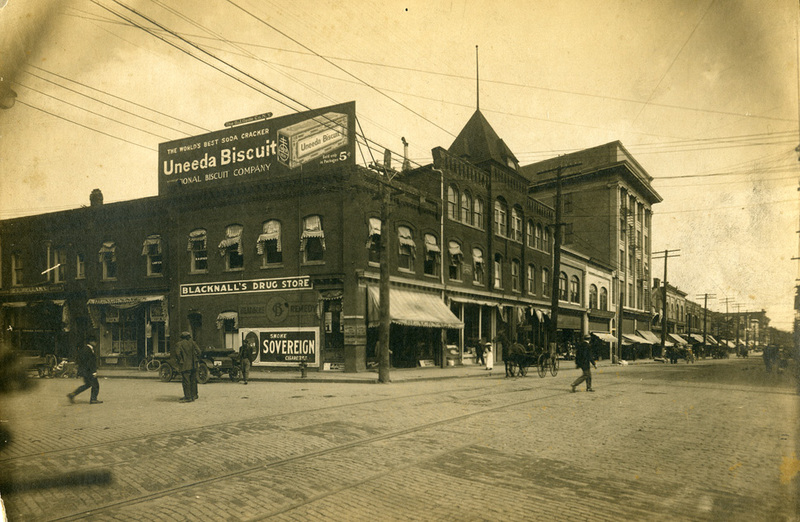 Before that, two buildings sat on the site of the later Geer Building: Blacknall's Drugstore was on thie corner, and Stokes Hall (the Opera House) sat immediately to its east. Blacknall's Drugstore was established in 1873 by Richard Blacknall and his father. 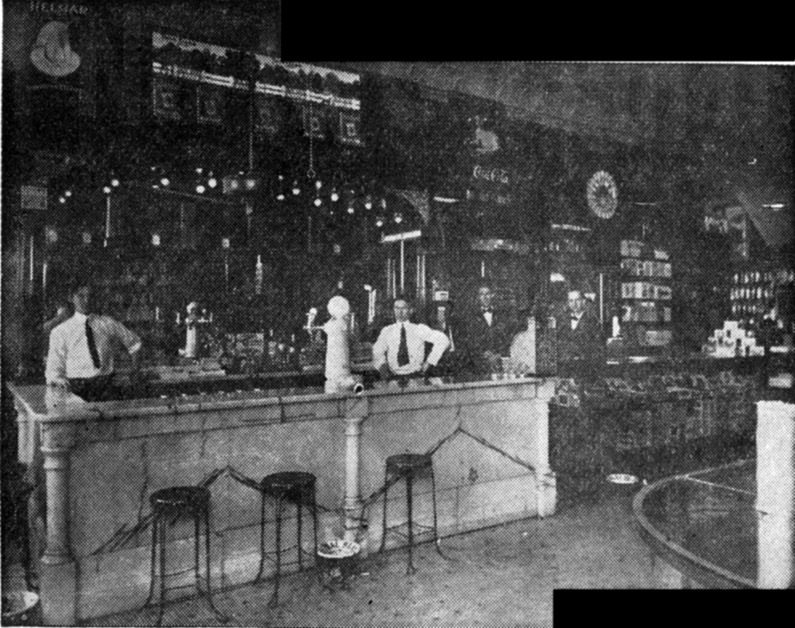 Interior of Blacknall's Drugstore, 1900. Stokes' Hall, also known as the Opera House, was a performance venue and site of city council meetings prior to the construction of the Municipal Building / Academy of Music. The hall hosted theatrical performances, the Durham Choral Society, and early movies. 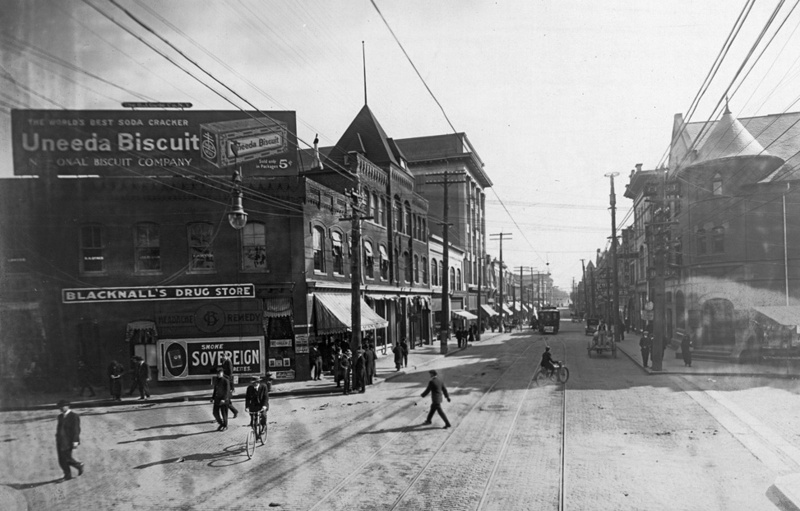 Looking east from Corcoran and West Main, circa 1900. A new building was constructed on the corner of Main and Corcoran Streets, modelled on a Florentine Palace. It was called the (Frederick) Geer Building, and designed by Alfred C. Bossom, British-born (and later member of Parliment) and nationally renowned for his bank designs. Architectural Plans for the Geer Building. Construction of the 5-story building, L-shaped, with the L at an obtuse angle to match the angle of Corcoran and West Main Sts., was completed in 1915. Fidelity Bank was the major tenant of the building. Fidelity was organized in 1887, capitalized with $50,000 by Washington Duke, Benjamin Duke, MA Angier, and George Watts. Fidelity was initially located in the Wright Building, diagonally across the intersection from this location. Presumably after the falling out between Wright and the Dukes/Watts, Fidelity moved to the Trust Building after it was completed in 1905. After the completion of the Geer Building, Fidelity became the anchor tenant, with the main branch and offices in the building. 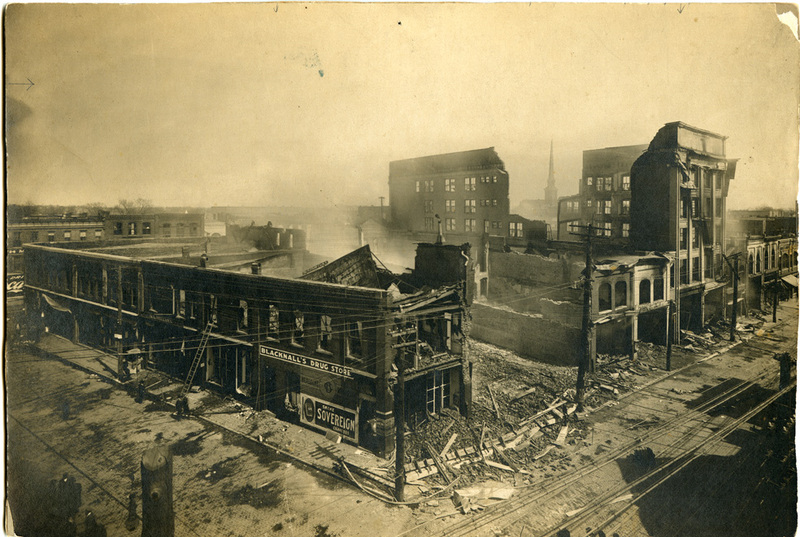 Blacknall's Drugstore returned after the fire, located on the ground floor facing Corcoran, and remained a tenant until 1932, when it moved west on W. Main St. and became "Durham Drug Co." Woolworth's was located on the West Main St. ground floor of the building. The Geer Building helped form part of a corridor of signficant, sizable structures that straddled Corcoran Street. Multiple independent professionals (doctors, lawyers, accountants) had offices in the Geer Building. Above, a view of the buildings lining Corcoran: the Geer Building, First National Bank building, the Durham Hosiery Mills buildings on the east side; the Croft Business School, and the roof of the old post office are visible on the west side. This was taken from the top of the Washington Duke Hotel; (all are gone except the First National Bank building) - late 1920s. Corcoran Street, looking south from close to Parrish Street. The old post office is on the right, the Geer Building, First National Bank Building, and Durham Hosiery Mills on the left. John Wily succeeded Benjamin Duke as president of the bank in 1922, and was succeeded by Jones Fuller in 1938. By 1939, Fidelity's offices has continued to expand, and they purchased the entire building, renaming it The Fidelity Bank Building. They later acquired the commercial structures immediately to the north of the building as well. John Sprunt Hill was known to have been in keen competition with the Fidelity through the mid-20th century with his Durham Bank and Trust Company. In 1953, Fidelity was the largest bank in Durham, with $27,000,000 in assets; Durham Bank and Trust was second, with $22,932,000. Fidelity never expanded beyond Durham, with one branch in West Durham, one in East Durham, and one in north Durham. In 1956, Fidelity Bank was acquired by Wachovia Bank of Winston-Salem, and absorbed under the Wachovia name. Geer Building, known in the 1960s as the Wachovia Building - 02.20.61. Wachovia demolished the original home of Fidelity, the Wright Corner / Croft Business School building and built a new branch on that corner (the southwest corner of Main and Corcoran). In 1972, the vast majority of the Geer Building (and the Nancy Grocery to its north) was demolished. Curiously, a not-so-large portion of the building remained - the part containing Woolworth's. And you can see that they just chopped it off where they felt they needed to, leaving a chunk of the old arched doorway on the left side. Woolworth's eventually donated the remainder of the Geer building to the city, which let it languish. Fire ravaged the building next door (on the Parrish Street side) and caused additional water damage to the building. The city eventually stated that there was a "toxic mold" problem in the building, and asbestos, and that it needed to be torn down. It would be good if they read the CDC page about so-called toxic mold. And asbestos, well, that's pretty much in every old building. But the city had plans. The bulldozers are back, 2001. Think they cleaned up the 'toxic mold' before they aerosolized billions of evil spores through demolition? Getting ready to take down the last remnants of the Geer building, 2001. "$10 – 15 M – Woolworth Site Redevelopment — located on the site of one of the first civil rights sit-ins in the country, the historic building stood abandoned for a number of years, simultaneously growing a toxic mold problem coupled by the presence of asbestos. 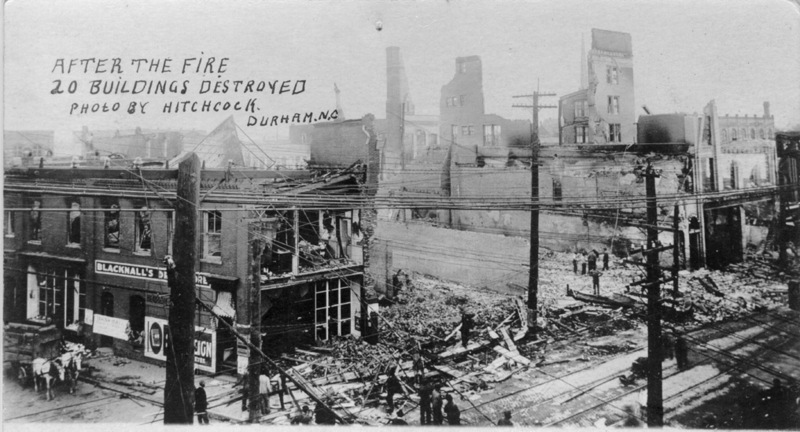 Noting the serious problems of the old building, the City of Durham financed the demolition and cleaning of the site. Next a call was issued for proposals on the redevelopment of the space, and a local development team was selected. OEWD is currently discussing a development agreement with this team for a signature 75,000 SF building at the historic Woolworth Site." So, the last vestiges of the Geer Building were in the way of economic development, and the building was torn down. The coda to this saga is the city's attempt to expand this vacant area for their "signature building" by going after privately-owned 120 West Main Street with the demolition crew back in January. But that's a story for another post. View of site of Geer Building, looking north on Corcoran, from similar vantage point to 1971 photo, 2006. View of vacant Geer Building/Woolworth's site, 2006. After this site was acquired by Greenfire Development, there has been much talk of their development of the "signature building" on this site. As of June, 2009, Greenfire released renderings showing what their proposed structure would look like - an improvement over previous iterations that would have demolished much of the remaining structures in the block. Looking northeast from Corcoran and West Main. Looking southeast from Corcoran between W. Parrish and E Chapel Hill. Looking southeast at the 100 West Parrish St. storefronts from W. Parrish and Corcoran.